Workpackage is defined as the effort required to produce deliverable in a project. Talking about effort, this can be a set of tasks that can be performed from one, multiple people, or multiple teams. A work package can stand as a smaller process inside the main Project, sometimes also refer as a portion of the work breakdown structure (WBS). 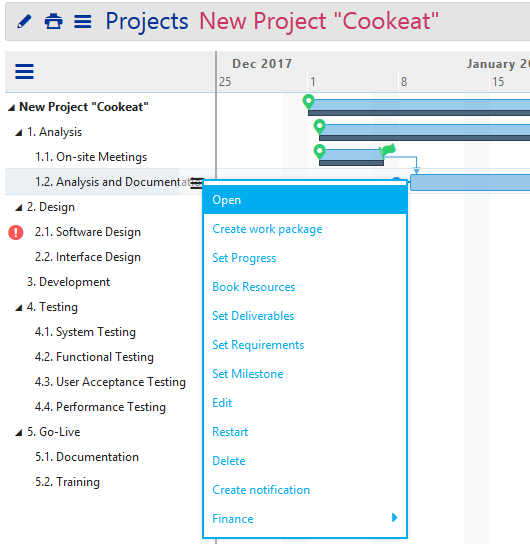 In Comidor, a Workpackage has been setup during the Projects (Scheduling) phase using the Gantt chart. Work Packages can be created directly from each Project’s Gantt Chart. From that point, you may also set and later on edit each Work Package Deliverables, Requirements, Milestones, Constraints, Financial Data and of course Set Progress. Financial Data can be added and managed from the Project Manager. Simple users that have been booked through Personnel Booking of a Project and accepted to work on this Project’s Work Packages from Personnel Booking Approvals, have been assigned to that Work Package. 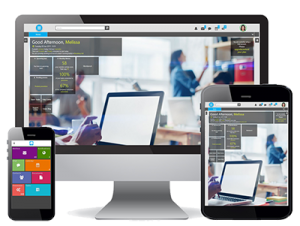 They can add Tasks and Expenses that are related with that Work Package from Timesheet unit. Still, from Work Package inside, Project Manager, Project Manager 2 & Supervisor can track Tasks from the Kanban Board. These Tasks will be displayed in simple users’ Calendar and Timesheet. To enter a Work Package, you should go to Application Menu Icon > Projects> WorkPackages, where you can identify all the Work Packages that you have created (as Project Manager) or have been given access (as Project Manager 2, Supervisor, Assignee). Alternatively, you may enter the Work Package from the Project’s inside, in the Gantt Chart, provided that you have access on the Project’s details. Click on the WorkPackage actions button and select Open. In the Summary tab, in Schedule Summary section, you see the Work Package critical information. Some of them refer to the Work-Package Name, to which Project is included, its State, the Workload information (completed tasks’ hours, scheduled WP’s hours, booked tasks’ hours), remaining Time information, Scheduled and Actual dates. Most importantly, you will see to whom this Work Package is assigned to, which actually is the Personnel to whom the Working Hours have been booked into for this Work-Package. In case you are Project Manager, Project Manager 2 or Supervisor, you will also have access on the Kanban board. Add a new task: Click on “Add Task” and a Quick Add: Task pop-up comes on your screen. Fill the necessary information and press Save. Check Tasks’ progress; there are Tasks To Do (the ones with orange color), others in Progress (the ones with blue color) and Finished ones (the ones with green color). 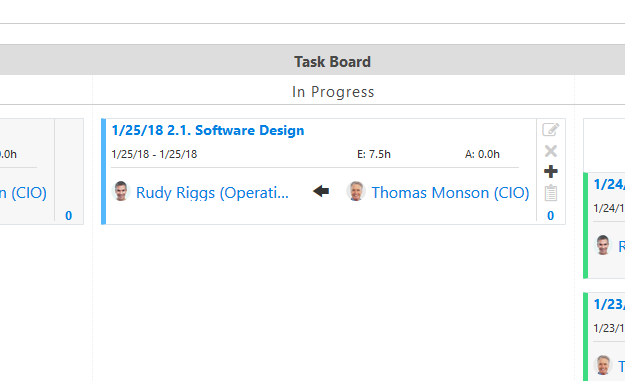 To manage a Task, simply hover your mouse over the task box on the right corner and edit, delete, quickly add a new sub-task and finally jump into reports section of Work Package. An indicative number shows up how many sub-tasks have been created inside that Task. You can access a Task simply by clicking on it. Get informed for its Scheduled Start Date, Scheduled and Actual Duration, Assignee and Assigner. You can confirm a Task’s completion (when you are the assigner of this Task), simply by clicking on “Confirm as completed”. Collapse or Expand the Summary above the Kanban board with the arrows. To change Work-Package (Process) state, click on the state button on top right. Then select the state of the Project. As Work-Package has already been created, it may be in an Opened, Confirmed or even in Scheduled state. Opened Work-Packages are the ones that have simply created, Confirmed Work-Packages may be the ones that have been scheduled to start in a certain period. Scheduled Work-Packages are the ones that Project Planning has been implemented (Requirements, Deliverables, Gantt Chart). Running Work-Packages are the ones that have already started. Each time you select a state, a new pop-up window appears, where you can now set a different start time and date or take as granted the suggested time and date. Click on Save. See the changes applied in the Gantt Chart. Paused, Failed or Canceled Work-Packages can be used as states on a Project, too. Click on Completed to set a Work-Package as complete. Update start and finish dates and times, duration, quantity, importance and priority fields and click on Save. See the update in Gantt Chart. In the Constraints tab, you will see the Work Package Constraints, that have been set in the Gantt Chart. Focus on its Relation type, which could be Finish to Start, Start to Finish, Start to Start, Finish to Finish. From this point, you can enter the related Work Package. 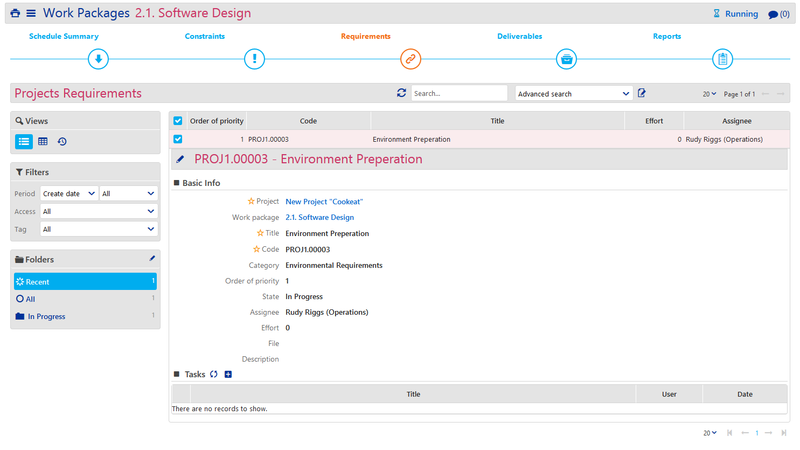 In the Requirements tab, you may view the Work Package Requirements that have been set in the Gantt Chart in Project Scheduling phase. You can manage all Requirements of the Project via Requirements tab of Project. Click on one Requirement to see its info or Quickly Add a Task that will be related on this. 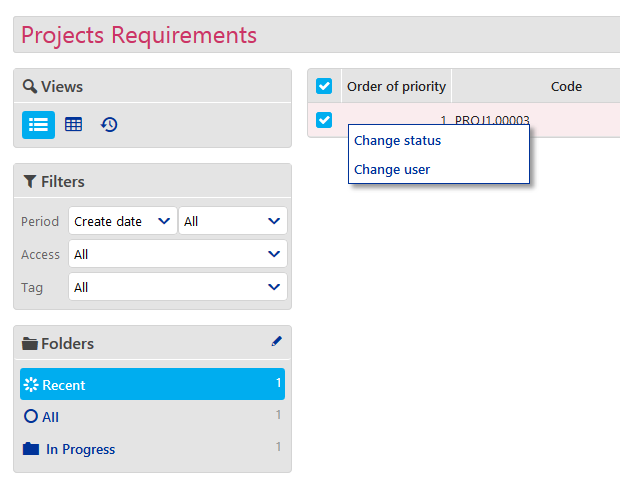 Select one or more Requirement(s) to change status (pending, to do, in progress, done, canceled) or change (assigned) user. In the Deliverables tab, you may view the Work Package Deliverables that have been set in the Gantt Chart in Project Scheduling phase. You can manage all Deliverables of the Project via Deliverables tab of Project. Select one or more Deliverable(s) to mark them as delivered or not delivered. Also, you may wish to Print them in the new tab that opens or Export them in an .xls. In case you select to set a Deliverable as delivered, a pop-up opens in order to search and set an already uploaded File as the Deliverable. Press Save if you do so, otherwise Save it without a document. Delivery date will be updated automatically and you will have also direct access on the File from that point. In the Reports tab, you may view Task Reports for this Work Package. Pending Tasks are in red and Completed ones in green. In a specific Task, in the small Actions button, press Focus to zoom in this with its Child Nodes or press Hide Child Nodes to hide any sub-tasks it may has. You can simply Restore Hidden by pressing big Actions button. Click on the Actions button to print Tasks Representation, download it as PDF or zoom in and out on each Task. In order to output a Weekly User Tasks’ Report on all Tasks on all WorkPackages, search a specific user, set up the balance date (which will bring you the week) and press Fetch Report. In the Notes tab, you may write down a comment about a specific Work Package. Users having access on that, will receive a Note-Notification. Simply add a Comment using a simple or enriched HTML Editor (Open editor). Users can click on Refresh to see new comments; click on Show More or Show Less to see the amount of comments they wish below a Personnel. In the Files tab of the Work Package, you may upload related files straight from your Desktop or by clicking on the globe icon to attach a File URL or attach existing Comidor file from Files. Click on an already uploaded file to Open it (downloading and previewing of current and previous versions are available), Rename it or Delete it. In the Workflow tab, you could have a Workflow preview, if Project is connected with a Workflow and does not comes with the Gantt Chart planning. Click on Tags to add a new Tag on that Work Package that it may be private, group, internal or public. From this point, you can also manage old tags that have been added on that Work Package. Putting Tags in Work Packages may help you in grouping them, filtering and finally find them easier. Click on Links to add a new Link between this Work Package and any other Comidor entity e.g. a Project, an Event, etc. 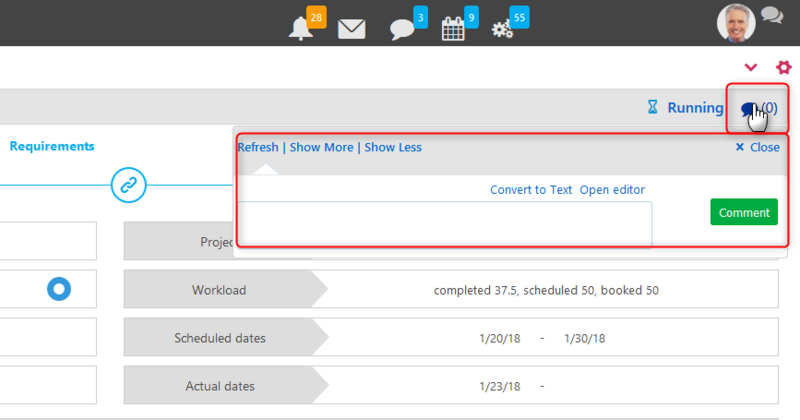 Click on Notifications at the side-box to see all the Reminder – notifications that have been created, are scheduled or sent regarding this specific Work Package. The notifications may refer to process completion, process start, process delay or time before its start. You can see these notifications’ date and times sent, whether they are read and removed, too. Reminders like these may be set through Gantt Chart (Set Reminder option). Click on Resources Budgeting tab to check all the pending Resources that have not yet approved or rejected by Resource/Line Managers. Users can press tabs Budget Income, Budget Expenses, Income & Expenses, so as to search and view financial information that has been set for this Work Package inside that Project. Important information such as the Expected amount of money that should receive or is spent is provided and depends on the Product or Service’s Category. Click on Resources Used tab to check all the approved by Project Manager work-hours of user(s) assigned on this Work-Package. Delete: to delete the Work Package. A confirmations message will appear. Link with: to Link this Work Package with any Comidor entity (other process, account, contact, project, opportunity etc.). A pop-up window appears. Notify: to send a Note-Notification to a person or group of people regarding this Work Package. Duplicate: to copy and create a Work Package based on this one. A new pop-up window appears, so as to create a copy of that Work Package. Put the Title of this new Work Package, set up the Scheduled Start date, search and relate the Account you wish, write down a Description and finally, choose whether to include the Subprocesses (sub-Work Packages) and Tasks. Press Create Process to proceed or Cancel to cancel the procedure. Print notes: to print comments that have been added below the Work Package in its Discussion box. A pop-up appears, so as to select the timeframe and press OK. Follow browser’s printing procedure in the new tab that opens. Go to Application Menu Icon > Projects > WorkPackages, where you can identify all the Work Packages that you have created (as Project Manager) or have been assigned to you (as simple user). Press the Actions button to select between printing current view or exporting all/current page in a .xls file. Delete multiple WorkPackages at once. A confirmation message will appear. Link multiple WorkPackages with other Comidor entities. Print Notes added inside specific WorkPackage. You may set up the date frame and click on Print. Check your browser settings for pop-up window. Change State of the WorkPackage (Opened, Confirmed, Scheduled, Running, Completed, Failed, Canceled). Change category from the one(s) set, when WorkPackage(s) were created. Add Tags so as to identify easily your tagged Workpackages. Automate a WorkPackage (Process) by sending a copy to Process Scheduling unit. You may enter that unit and adjust it, add repetition etc.